Depreciation of the rouble has caused a dramatic drop in the number of Russian tourists to Vietnam with travel firms in Khanh Hoa Province and Phan Thiet City worried about the overall impact of the downturn. In 2014 Khanh Hoa Province welcomed some 856,000 foreign visitors, up more than 20 percent year-on-year, and Russian tourists accounted for 245,000 during the year, up more than 60 percent on the previous year. But since the start of December, Russian tourist numbers have tumbled by more than half. In previous months, Long Son pagoda in Khanh Hoa Province’s Nha Trang City welcomed hundreds of vehicles carrying Russian tourists for sight seeing every day, raising concerns about traffic congestion. But now, the number of vehicles has dwindled to the dozens. There were warning signs ahead of the downturn, as Russian tourists had been operating on tight budgets. 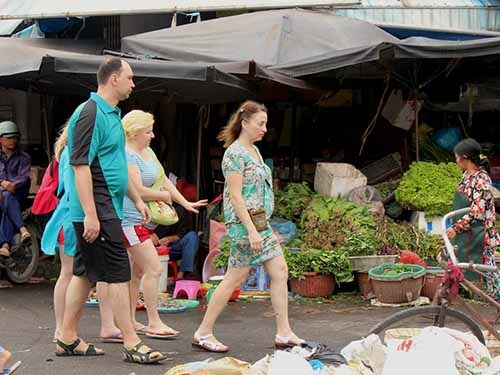 “Many Russian tourists were eating instant noodles, and buying food and cooking tools so they could cook for themselves, instead of eating out,” said Nguyen Thi Ngoc, a small trader at Xom Moi market in Nha Trang City. Thai Hong Son, director of Sputnik Tour Tourist Company, said Russian tourists spent on average USD2,000 on air tickets, accommodation, sighteseeing tours and food. But the collapse of the rouble means that cost has doubled for Russians in terms of their local currency. A similar downturn is being reported in Binh Thuan Province, with fewer Russians visiting Nui Ne beach in Phan Thiet City. Le Huu Anh, head of Hai Au resort’s human resource management centre, said the number of Russian visitors has dropped by up to 50 percent. Some resorts are reporting a decline of up to 80 percent of Russian occupants. Some travel firms have cancelled charter flights to HCM City and Phu Quoc Island in Kien Giang Province. Hoang Thi Pho Thu, chairwoman of Anh Duong travel firm’s board of directors, which covers 60 percent of Russian tourists to the Vietnam tourism sector, reports a 40 percent decline in the number of such tourists. “Due to the depreciation of the rouble against the US dollar, Russian tourists have to pay more for outbound tours. We’re trying to attract more tourists by lowering prices and intensifying promotion programmes,” Thu said. Le Thanh Truc, deputy director of Khanh Hoa provincial Department of Culture, Sports and Tourism said the decline would affect local tourism development.